One of the coolest pieces of furniture I’ve seen ~ this gorgeous chaise lounge is beautifully carved and the shape is so elegant. The upholstery is classic. It looks Scandinavian to me, perhaps Gustavian. If you’re interested, it’s at Laurie’s Trunk, so give her a call (612-558-2886) or run over there (9066 Lyndale Ave S, Bloomington, in the Great Bear Shopping Center) NOW!! 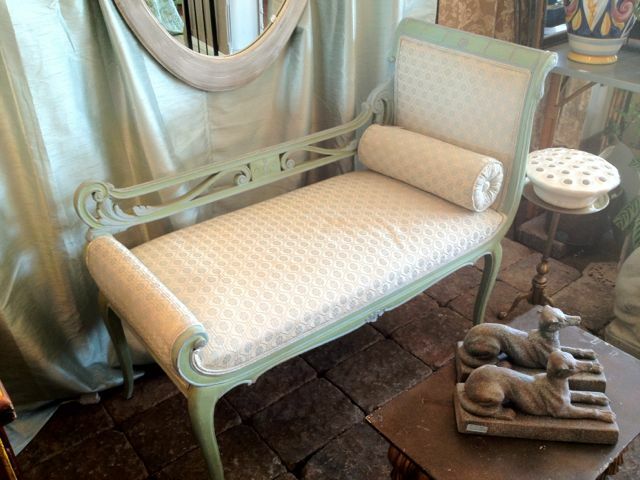 This entry was posted in Friday Find and tagged chaise lounge, Gustavian vintage chaise lounge, Laurie's Trunk, Laurie's Trunk Antiques, Scandinavian chaise lounge, Scandinavian vintage furniture, vintage chaise lounge. Bookmark the permalink.